Takht Movie Release Date, Star Cast - Get all the latest information about Takht, It is an upcoming Bollywood period action-drama film which is directed by Karan Johar. There are so many Bollywood actors are working together, It is a multi-starrer film, Ranveer Singh, Kareena Kapoor Khan, Alia Bhatt, Vicky Kaushal, Bhumi Pednekar, Janhvi Kapoor and Anil Kapoor are playing the lead role. 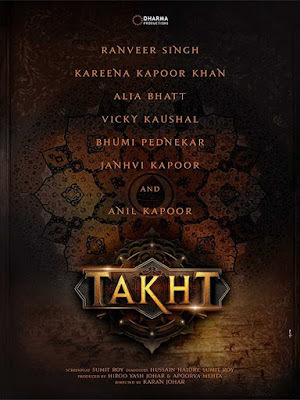 Takht is produced by Hiroo Yash Johar & Apoorva Mehta under the banner Dharma Productions. The movie will hit the big screen in 2020. According to sources, Ranveer Singh is playing the role Aurangzeb and of Vicky Kaushal is portraying the character of Aurangzeb's elder brother Dara Shikoh. Kareena Kapoor Khan as Aurangzeb’s sister Jahanara, Anil Kapoor as their father Shah Jahan, Alia Bhatt as Shikoh’s wife, Bhumi Pednekar as Aurangzeb’s wife and Janhvi Kapoor as a slave girl. It is scheduled to hit the big screen in 2020. It is a big budget film, fans are very excited for this film.